In the middle of a brainstorm, a spark of an idea started to smoulder. We are always looking for new and interesting ways to engage with our customers, providing education as well as making ourselves contactable. Something fun, easy to use and a bit different, a way to reward our patients and to help them keep track of appointments. In short, we needed an App. 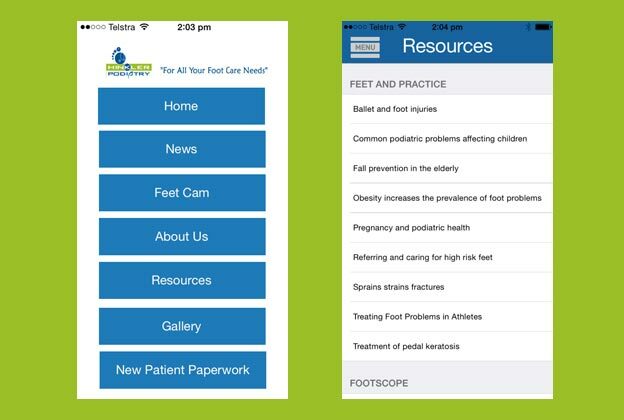 The Hinkler Podiatry App allows our patients to contact us directly via a variety of platforms including phone, email, Twitter and Facebook without the need to navigate through multiple screens of your smartphone. It has a handy feature to keep a track of your upcoming appointments, with each appointment earning you a foot stamp in your passport. Collect enough stamps and be rewarded with a special thank you gift. Downloading the App gives you access to special offers and discounts on consumables like Rocktape, creams and footwear. A common reason why a new patient contacts a health service is if they notice a problem or if something “just doesn’t look normal”. The handy Foot Cam feature allows patients to photograph the area of concern and email it confidentially and directly to our clinicians. This can be especially useful in problems involving swelling or if a parent is concerned about how a child is standing. For the new or prospective patient, there are useful information sheets involving common conditions like plantar fasciitis, warts, flat feet and sporting injuries. This can be useful when discussing your health concerns with your practitioner. There is a page explaining some of our equipment as well as a photo gallery featuring our team in action. The App is available in both the Apple App Store or from Google Play. Best of all, it is free. A big thanks to Rod Barrand at Elicere for making the whole process of building the App simple and easy. And for helping all of our patients get Appy.